Two of the major players did not make the start line and two other highly fancied entries did enough damage to warrant pulling out of Race 2 of the Rolex Trophy Rating Series which started today on the Manly Circle just north of Sydney Heads. 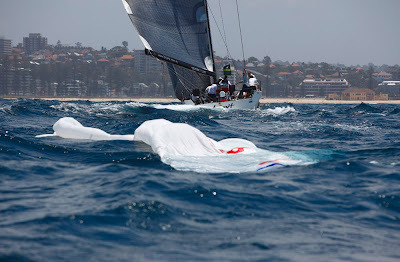 A touch of start day nerves, some crew changes and lumpy seas all added to an interesting day of windward/leeward racing in the Cruising Yacht Club of Australia organised series. 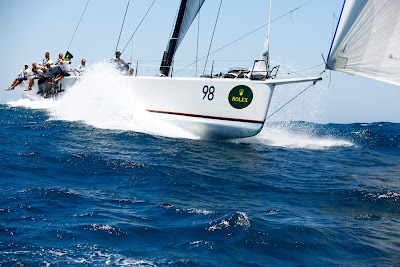 RÁN’s late Sydney arrival in the early hours of this morning after being off-loaded at Port Kembla following transportation from the UK by ship, meant there was too little time to prepare the 2009 Rolex Fastnet Race overall winner for racing today. The good news is, fellow competitors and spectators can expect to see Niklas Zennstrom’s JV 72 in action for the remaining three days of racing. 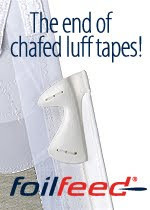 Meanwhile, out on the course area, the 12 remaining yachts sailed in two divisions on a lumpy sea that got rougher throughout the day in a 10-20 knot north to nor-easterly wind that gusted to 25 knots at times with the odd shift thrown in. 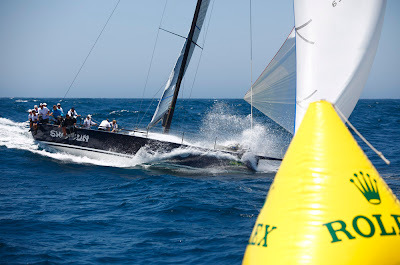 Rolex Sydney Hobart pre-race favourites Stephen Ainsworth’s RP 63 Loki (CYCA) and Michael Hiatt’s Farr 55 Living Doll from Victoria, were casualties of Race 2. The yacht was taken immediately to Sydney City Marine where it will be hauled out of the water to reveal just how much damage has been done to the engine, propeller, gear box and bearings in the hull of the yacht. At this stage it is not known if the yacht will be race-ready for tomorrow’s two windward/leewards. The businessman, who owns the Living Doll clothing label, said he had brought in four young guys from Australia and New Zealand and renowned ocean racing navigator, Andrew Cape, to compliment an already solid crew that includes tactician Ross Lloyd. Leading the series following Races 1 and 2, Alan Brierty’s RP 62 Limit was not without dramas either. Winning Race 1, things were not so simple in Race 2; losing control of their heavy spinnaker at the first leeward gate, forcing the Limit crew to cut it away from the boat. It was rescued by Principal Race Officer Denis Thompson and his on-water race management crew. Limit still managed to finish third in the diminished fleet. Owner, Alan Brierty, was thrilled to be the leader on Day 1. “Considering we have a pretty new crew from all over the world, I think we did a great job.” Like Hiatt, Brierty has some of his regulars, such as Keenan, but others, including Gavin Brady, could not make it this year for various reasons. “We’ve got guys from Spain, England, New Zealand, America and Australia; it’s a boat of all nations,” said Limit’s eccentric owner who is currently sporting dreadlocks. Rob Hanna’s Shogun, the JV 52 formerly known as Wot Now, is second overall in the series. Now based in Victoria, Hanna has also added some world champions in various classes to his crew of local sailors, in the shape of Steve McConaghy and Sean Kirkjian. “Yep, we’re pretty happy with our day,” McConaghy said. Geoff Ross’ RP 55 Yendys (CYCA) was third overall. “Today was a good workout and reminds us what to expect in the race to Hobart,” was his synopsis of the day. However, Ross subsequently retired from both races, telling officials: “Due to circumstances beyond our control, we elected to withdraw, but we’ll be back on the race track tomorrow.” Ross would not elaborate, instead opting to explain his reasons tomorrow. “Sorro”, who has Andrew Buckland aboard for the series, another famed skiff and yacht sailor, had the most consistent day. 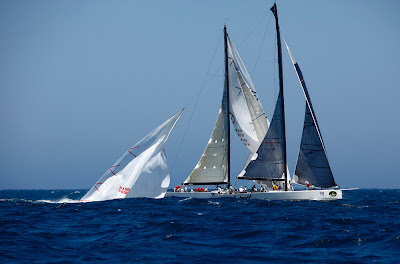 He has a two-point lead over Paul Clitheroe’s Beneteau 45, Balance (CYCA) and Chris Dare’s Audi Centre Melbourne, from Melbourne. 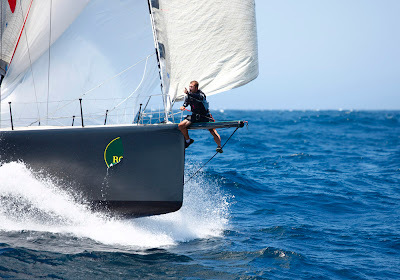 The 1999 Rolex Sydney Hobart winner, Knee Deep (formerly Yendys), owned by West Australian winery operator Phillip Childs and Frank Van Ruth, left the course during Race 1 after jamming a spinnaker halyard. A crew member sent up the mast so the spinnaker could be dropped. It took some time, so boat and owners elected to pull out of racing today.